STRINGERS: Stringers are round in cross-section, about 1.0mm thick and 17" long. Stringers are tested compatible to the System 96 expansion standards. Stringers are thin enough to bend in a candle flame, and can be used in myriad ways - from bead work to picking up on blown forms. They may also be mixed with Noodles for exciting optical effects. They are packaged in 5 ounce tubes (Approx. 90-110 pieces). NOODLES: Noodles are named after fettuccini noodles, which they resemble, and for the forming process that rolls and stretches them. They are about 1.0mm thick, 5mm wide and 43 cm (17") in length. Noodles are made entirely from glass tested compatible to the System 96 expansion standards. Noodles may be used either singly on sheets or blown forms, or in mass, depending on your design goals. 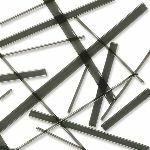 They may be fused together for cutting into Murrini for fusing or blowing components, overlapped, woven and tack fused to create baskets, and are convenient for bead making. 18" tubes contain 5 ounces of noodles (Approx. 20-30 pieces). 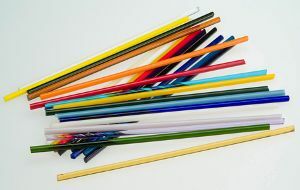 RODS: Rods are machine pulled from System 96 tested compatible glass formulations. As a result they are straighter and more consistently round than hand pulled rods. System 96 rod users love the low shock factor of Uroboros rods, which results in a safer torchworking experience.